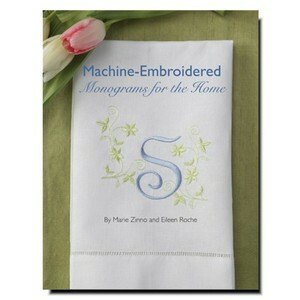 Machine Embroidered Monograms for the Home by Stitching Sisters, Marie Zinno and Eileen Roche. 50 Pages with CD, 3 Fonts in 3 Sizes, 28 Frames. From Stitching Sisters, Marie Zinno and Eileen Roche have teamed up to write Machine-Embroidered Monograms for the Home. This 50 page book is not only filled with inspiration and helpful information on monogramming etiquette, it also includes a design CD with 3 fonts in 3 sizes and 28 frames and bracket designs to enhance your monograms. All the projects featured in the book use the designs contained on the CD! 3 Font Styles PLUS Accents! Machine-Embroidered Monograms for the Home has the perfect fonts, frames and accents for you to create a personalized lampshade for a child's room, hallway, den, kitchen or bathroom. Machine Embroidered Monograms for the Home by Marie Zanno and Eileen Roche.